From Alan Templeton, "Out of Africa again and again." Nature 416 (2002): 45 - 51. Full text (external). The model of recent human evolution shown in Fig. 1 is dominated by genetic interchange and a special role for Africa. I consider first genetic interchange. African and Eurasian populations were linked by recurrent gene flow, certainly over the last half a million years, and probably longer. Overlaid upon this gene-flow trellis are occasional major movements out of Africa and out of Asia that enhanced gene interchange through interbreeding. More recently, population expansions acted to extend the geographical range of the human species and to establish additional areas linked by gene flow. This model emphasizes that genetic interchange among human populations, facilitated both by gene flow and range expansions coupled with interbreeding, has been a major force in shaping the human species and its spatial pattern of genetic diversity. Second, Fig. 1 reveals the special role that African populations have played in human evolution. There were at least two major movements of peoples out of Africa after the original spread of Homo erectus. This inference is consistent with the archaeological record of cultural expansions out of Africa (Acheulean) in the middle Pleistocene44-48. These Acheulean cultural expansions broadly overlap the time frame of the middle out-of- Africa expansion event shown in Fig. 1, indicating that this expansion involved both people and ideas coming out of Africa and interacting with local populations in Eurasia. This expansion is also compatible with the fossil data. After the initial expansion of Homo erectus out of Africa about 1.7 Myr ago, there was little change in average brain size up to 700,000 years ago1. By 400,000 to 500,000 years ago, average cranial capacities had shown a substantial increase1. The time period of this transition in cranial capacity overlaps extensively with the time period for the older out- of-Africa expansion event shown in Fig. 3. The most recent out-of-Africa expansion event shown in Figs 1 and 3 is also compatible with fossil evidence. Many 'modern' traits (such as high, rounded skulls; small brow ridges; a vertical forehead; and a noticeable chin) first appear in Africa about 130,000 years ago, followed by an expansion out-of-Africa more than 90,000 years ago1. 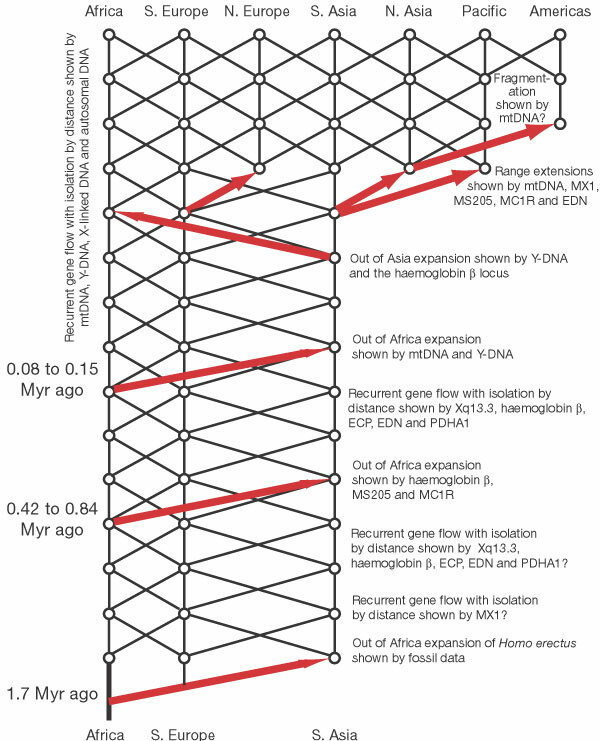 This time frame overlaps extensively with the out-of-Africa expansion marked by the mtDNA and Y-DNA distributions in Fig. 3, implying that many of these traits could have been carried into Eurasia by this African population range expansion. Other traits, however, do not display any significant changes before, during or after this most recent expansion out of Africa1. This later set of traits is difficult to reconcile with a population replacement, but is compatible with this most recent out-of-Africa expansion event being characterized by interbreeding. With interbreeding, mendelian inheritance allows some traits to spread while others do not. Moreover, living humans are still polymorphic for 'modern' traits, and the frequencies of different 'modern' traits show heterogeneity in their present geographical distributions1. The current spatial and frequency heterogeneity in 'modern' traits undercuts the idea of a global replacement of an 'archaic' type by a 'modern' type but is consistent with a trait-based evolution of humans that is allowed under expansion with interbreeding. The model in Fig. 1 indicates the recent fossil evidence should be interpreted in terms of traits and not population types. The genetic impacts of Africa upon the entire human species is large because of at least three major expansions out of Africa, although the genetic impact is not as complete as it would be under total replacement. This model is similar to earlier models that have emphasized the role of out-of-Africa population expansion coupled with gene flow and not replacement, such as the assimilation model of Smith et al., the multiregional model with expansions followed by admixture of Wolpoff et al., and the 'mostly out of Africa' model of Relethford. The predicted large genetic impact of African populations explains the results of Takahata et al. that about 90% of the haplotype trees in the nuclear genome appear to be rooted in Africa. These results37 also falsify a total replacement hypothesis, which predicts that all haplotype trees with coalescent times greater than 100,000 years must be rooted in Africa. All of the haplotype trees considered have expected coalescent times greater than 100,000 years, so 100% of such old trees should have African roots under complete replacement, and not the observed 90%. The results given here show the importance of examining many DNA regions with a common analytical technique in making phylogeographic inferences. Indeed, the clearest result from Tables 1 and 2 is how incomplete our view of human evolution would be if it were based upon just one locus or DNA region. As more DNA regions are examined, additional insights into human evolution are sure to follow. However, this current analysis already demonstrates the inadequacies of both the out-of- Africa replacement model and of a simple trellis model. Humans expanded again and again out of Africa, but these expansions resulted in interbreeding, not replacement, and thereby strengthened the genetic ties between human populations throughout the world.